Insane Asylum of North Carolina Annual Report of the Board of Directors and the Superintendent of the North Carolina Insane Asylum, for the Year Ending November 30,1884. 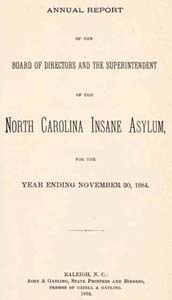 Annual Report of the Board of Directors and the Superintendent of the North Carolina Insane Asylum, for the Year Ending November 30,1884. Raleigh: Ashe & Gatling, 1884. Insane -- Commitment and detention -- North Carolina. Insane Asylum of North Carolina -- Finance. Insane Asylum of North Carolina. Mentally ill -- Care -- North Carolina -- Raleigh. Psychiatric hospitals -- North Carolina -- Raleigh. State hospitals -- North Carolina -- Raleigh.